Get 33/1 Arsenal or 40/1 Chelsea to win the Friendly match at Betfair! It's the first clash of the season between two Premier League giants and Betfair are offering enhanced odds on the Arsenal v Chelsea friendly match! Find here how to get 33/1 Arsenal or 40/1 Chelsea to win when you join via this page! It's risk-free! Arsenal and Chelsea commence to measure forces for the upcoming Premier League season when they go head to head in an unmissable friendly this Saturday! Who will win? 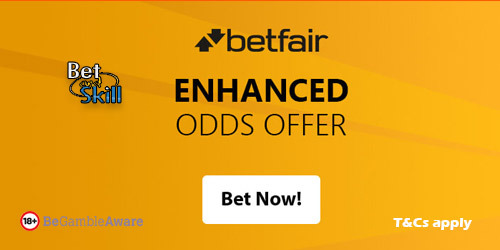 Make your choice and claim your risk-free price boost at Betfair! 33/1 Arsenal or 40/1 Chelsea to win! Place your first bet (max £/€1) on Arsenal or Chelsea to win Saturday's club friendly match! • Place a bet on Arsenal or Chelsea in the 'Match Odds (90 mins only)' market at the enhanced price. "Get 33/1 Arsenal or 40/1 Chelsea to win the Friendly match at Betfair!"